In the course of my career as a chef, I have only prepared brisket a handful of times. Don’t get me wrong, I love brisket, but it takes such a long time to prepare that I opt to just eat out. This time, I decided to go all out and make a bountiful feast for the ad agency I prepare lunches for. Braised brisket with cranberry onion jam, butternut squash mac and cheese, and balsamic green onions adorned the table today and can I say, it was a darn good lunch! Combine seasonings for brisket (paprika - onion powder). Rub seasonings on the brisket, making sure to cover every surface. Place brisket fat side up on a roasting pan and roast uncovered for 1 hour. Reduce heat to 300 degrees F. Add beef stock and enough water to yield about 1/2 inch liquid in the roasting pan. Cover brisket and continue to roast for about another 3 hours or until brisket is fork tender. Meanwhile, prepare the jam. Heat 1 tbsp in a medium-low saute pan over medium heat. Add chopped onions and saute until caramelized, about 20 minutes. Add a small amount of water if the pan becomes too dry. Add remaining ingredients (orange - vinegar) and continue to cook until cranberries soften and the jam becomes syrupy. Remove from heat. Slice brisket and serve with jam. Usually, when I prepare brisket, I braise it in a liquid like this beer braised brisket. Today, we’re taking a different route and starting with a dry braise and ending by adding beef stock. Start by trimming the brisket. I like to purchase the flat cut since it is fattier. Trim down the fat cap to 1/4 inch thick. Prepare the seasoning mixture and give your meat a good rub down. Place the brisket fat side up on a roasting pan and let it do its thing in the oven. After about an hour, the brisket should be browning in the oven and slowly breaking down. Add the liquid, cover, and continue to braise another 3 hours or until fork tender. My brisket took a little less time (about 20 minutes less), so depending on your oven, it may be ready slightly sooner or later. The top may appear burned, but it is actually just the seasonings that have caramelized. 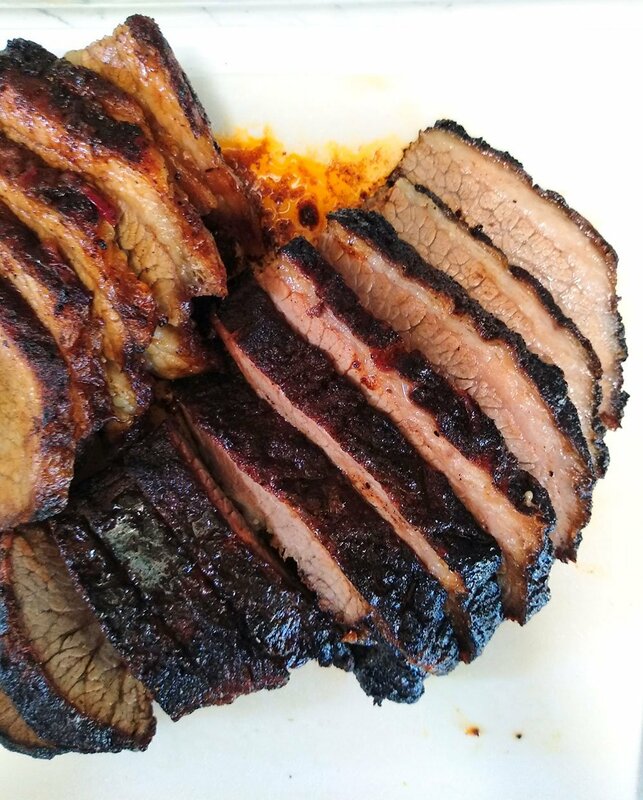 Slice into that brisket and admire your glorious work! This is what I call a Texas-style brisket without the smoker. While the brisket is roasting in the oven, prepare the jam. I used a combination of caramelized onions with the cranberries to balance the tart with some sweet. Chop the onions and cook on medium-low until they turn a lovely brown. If the pan becomes too dry and the onions appear as they as burning, add about 1/4 cup water. Once the onions are ready, add the remaining ingredients. I like to gently mash the cranberries after about 10 minutes to help them burst and soften. The cranberry onion jam is a little tart and a little sweet; if you prefer your jam to be sweeter, add more brown sugar. And now, judgment time. This braised brisket is probably the best brisket I have prepared to date. It’s true what they say, you don’t get older, you just get better! Paired with the cranberry onion jam, this is the holiday dinner to break out every year.